Ordered two for a master bathroom renovation. By far the best price I had found. These sinks are beautiful. Overstock shipped them VERY well protected. Perfect size and will end up being a statement piece in the bathroom. Drain is perfect as well. Will add more to my review once installed. Dimensions 18.8 In. X 14.3 In. X 5.3 In. We bought a vanity with dual sinks just like these. You need to make sure that you have a faucet that extends to the center of the sink to reduce water splashing outside the sine. We have a 7" faucet but it doesn't go to the middle and therefore, water splashes outside of the sink while you wash your hands. Ours are in the guest bath, so it won't be used on a daily basis. However, if it were a room that were used every day, I would give it 1 star and not recommend it. Also, because it's a square, you have to run more water and use your hand to rinse the sink out because the shape doesn't let gravity pull to the drain. 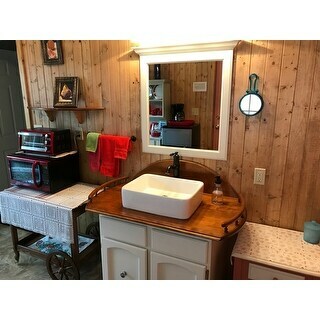 We bought this sink and had it installed more as a farmhouse type sink in our bathroom vanity. It is a great sink for the price. Love the pop-up drain--which is nicely sized. Some reviews indicate that there isn't enough slant for all the water to drain so you have to rinse it/clean it more. I guess I can agree with this, except for it doesn't seem to be a huge issue. I absolutely adore this sink. The photo doesn't do it justice - it's a gorgeous piece of hardware. I bought it to sit on top of a rustic wood vanity in my bathroom, and it's perfect. The look of the modern lines of the sink against the distressed wood is lovely. My husband appreciates that he can fit his forearm down in the sink so as to...what? Rinse his arm hairs? Wet his elbows? I'm not sure, but it was a selling point for him, and I'm just pleased he's pleased. Not that I'm going to let him actually *use* the sink. It's just too pretty. :) Anyway, you should get this sink, too. We installed this vessel sink in our powder room and are so happy with the result. This sink is sturdy and looks great on the slab of granite we had cut for the counter top. It has the little Kraus label under the faucet as well which seems like a high end touch. It didn't come with a drain, but we purchased one from the local hardware store for next to nothing. The faucet sits pretty high above the sink and I initially worried about splashes going over the side since the sink sides are pretty low, but the water hits directly on the domed spout and nothing splashes. This sink is the perfect size for washing our small cat, too, who is always getting into substances in the house that cause him to need a full bath. I recently ordered two of these rectangular sinks for my new vanities. The vanities came with a "vessel-type" sink which wasn't a vessel at all. My faucets wouldn't work with what came with the vanity. I searched Overstock and found this sink. The other reviews were positive and it seemed like the perfect size. I finally had everything installed last week and they are lovely. Just the right size--a bit smaller than what originally came with the vanity--a good thing because we now have more room on the vanity! These sinks also look better than the other ones. All in all, everything worked out well and these sinks are very nice--they are a definite improvement in our bathroom! I needed a vessel sink to put on top of an old dresser. The dresser was quite narrow and this little sink fit the bill nicely. The style is simple enough to not look out of place in my 1906 house. Used a wall mount faucet that reaches to the center of the sink, to avoid splashing, that another reviewer mentioned. Good quality sink. No complaints. I love this sink. it looks beautiful, is easy to clean and perfect size. I saw this sink about a year ago on Overstock, and have finally gotten around to the bathroom remodel. We purchased 2 for a double vanity and they are beautiful - which is a good thing since the whole bathroom re-do was planned around them ! Keep in mind they are large, but the quality is excellent, the price was extremely excellent, and they give the room a clean, uncluttered feel. Very happy with Overstock for getting them here quick and well-packed. I ordered three sinks. One had a defect that was noticeable, so I sent back the defective one and received another one in its place. the shipping was paid by the seller. The sinks were packed very well compared to the cheap Chinese sinks that are not packed very well and break during transit. Excellent sink, very heavy and made well. My recommendation is to spend a little more money and get a Kraus sink and not those made in China. We have been using two of these for a year now and have had no issues. The quality is amazing, I would definitely recomment these. The descrpition was perfect. dimensions right on, and loved getting it in only a few days. This sink looks very stylish in my newly remodeled bathroom. I have it mounted on an old bedside table with a piece of black granite on top. I like the contrast of old and new materials. With a square style sink, it takes a little extra to clean, but not a great deal. It looks terrific and is of a great quality. I love it! 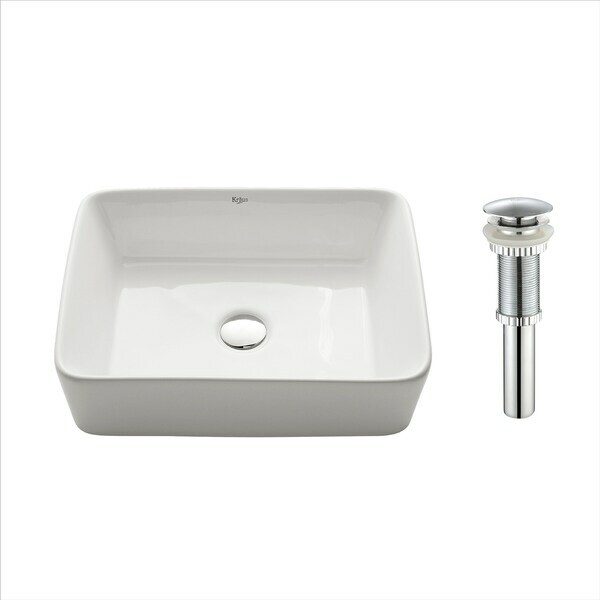 These sinks are beautiful and perfect for our bathroom reno. The size is just right and they are heavy and seem to be good quality. I would recommend them highly. This vessel sink looks so classy. Everyone loves our remodel. I removed the old sink from the vanity cabinet and mounted a coffee table top for a counter. The sink sits on top of the table, very old fashioned looking. Paired it with a farmhouse style brass faucet. The sink doesn't splash water out. The sink stopper is large and impressive looking. Nice deep bowl. Much more heavy duty than we thought. Getting ready to install but like that shape of this bowl. When kids brush their teeth the shape will avoid over spray. Very happy with look. Perfect for my rustic cabin installation. With the addition of bronze fixtures, it looks great mounted on my raw edge bathroom counter. Great size, sunk it about 1/2" into wooden counter. Looks sofisticated and easy care. Great sink!! We purchased this for our guests bathroom and it’s awesome!!! Looks good and easy to install. If you have strong water preasure it does tend to splash up and out. 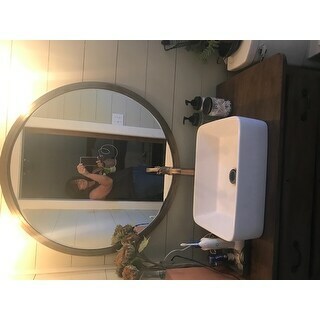 "Hello, I'm looking into purchasing this sink for a farmhouse bathroom. I'm having trouble finding a faucet that would pair well with it. Any advice?" "Is the Kraus logo removable or etched into the sink?" Etched into sink. But it is a nice sink. I have 4 of these. "Can you plug the drain for shaving purposes...to fill the sink with water for shaving face." "How long does it take to receive this sink after ordering?" I received mine within a week. "Does this come with faucet also. I noticed in q/a that the pop up drain is included. Is that accurate?" The faucet is ordered separately, but a pop up drain comes in the box with the sink. You end up getting a second pop up drain in the faucet package. "Where is this sink manufactured?" Hello Sharon, the country of origin is China. Please let us know if you have additional questions. Thanks for shopping with us. "Does this still contain the pop up drain? It no longer explicitly says that it is included." Hello Marz21, the pop-up drain is included. Thank you for shopping with us.